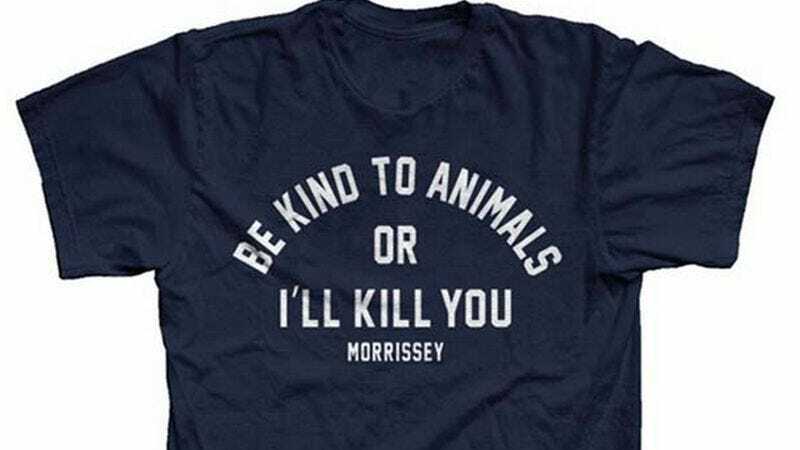 Various outlets are abuzz today about a new T-shirt available in Morrissey’s online shop that reads “BE KIND TO ANIMALS OR I’LL KILL YOU,” some expressing faux outrage and clutching their pearls at this heretofore gentle poet’s awful threats of violence. (When he’s allegedly trying to get a fan knocked off, that’s a different story.) But what they aren’t yet reporting is that Morrissey’s very dangerous T-shirt is an homage to/ripoff of one worn decades ago by Doris Day, the actress and animal-rights activist. Morrissey put his name on his version of the shirt, just so you’d know (and he could charge $40 for it), and he released it alongside a far more offensive-to-good-taste cartoon rendering of himself with “MEAT FREE” tattooed on his knuckles. (The sentiment is fine, it’s the cartoon that’s awful.) Here’s the part where we hilariously bring Moz’s lyrics into the Newswire: “If you must write prose and poems, the words you use should be your own / Don’t plagiarize or take on loan.” But as fans—even those who think the new stuff is pretty awful—know, Morrissey has always artfully borrowed from his influences, and he’s got a pretty wicked sense of humor. (“There’s always someone, somewhere, with a big nose who knows / who’ll trip you up and laugh when you fall.”) In other words, he’s probably not going to literally kill you if you eat animals, any more than he’s going to kill me for pointing out his homage/ripoff. Withering stares are likely, though.